Currently, the City of XXXXXXXXXX has a Cafeteria Plan through Seciton 125 of the Internal Revenue Code. It is my understanding that the Plan Administrator performs certain services at no charge to the City in lieu of selling insurance policies to the employees. Therefore, the role of the administrator and vendor of insurance products are combined. Senate Bill 273 addresses concerns regarding the role of the administrator and vendor of products. While this bill refers to Texas public school districts, I believe it may well apply to any employer group in Texas that offers a Cafeteria Plan. Section 9, subsections 4,5.6 address the issues in question. In my discussions with the Texas Department of Insurance, it is apparent that the acts of “enroller” versus “marketer” must be separate and distinct. An enroller who is working for the administrator who has contracted with the employer, has the advantage of promoting his products at the time of enrollment since he has the enrollee in a captive environment. Additionally, the “enroller” by virture of the function he is contracted to perform, has privileged information about the enrollee, (such as amounts and types of policies or contributions the enrollee has made, W2 information, salary and hourly information), that gives the enroller an unfair advantage. It is my opinion that to accept a free or reduced fee cost plan for Cafeteria Plan administration give the appearance or endorsement for the insurance products that are required to be offered (sold) to participants of the plan, thus giving one company preferential treatment over another. The offer of a free administration in return for the soliciatation of insurance policies may be a form of rebating as defined by the Texas Insurance Code. Since the City of XXXXXXXXX is currently requesting bids for their health insurance, I believe that it would be constructive to review and bid our the Cafeteria Plan Administration contract to incorporate some of the issues and concerns expressed herein. I believe that it would be beneficiall to the City of XXXXXXXXXXXX to align the employee health insurance program concurrent with the Cafeteria Plan Fiscal Year. There are distinct advantages to doing so and could be accomplished by bidding out administration now. In conjunction with bidding out the Cafeteria Plan Administration, I recommend that the City of XXXXXXXXXXX also bid out the insurance products to be offered through the Plan. This would mark a clear delineation between the enroller and the marketer. This would also give the City of XXXXXXXXXXX the advantage of competitively bidding out the insurance products, rather than be limited to the products offered and sold by the Plan Administrator. The end result may be better coverage at lower costs to the employee and eligible dependents. I hope this opinion and recommendation answers your questions. If I can be of any further assistance, or provide additional information as needed, please do not hesitate to call me. Editor’s Note: This letter was completely ignored by our client. They continued their “free” Cafeteria Plan Administration with a local insurance agent. This group of approximately 800 employees generates approximately $125,000 in annual insurance commissions on products sold through the city’s Cafeteria Plan. The Senate version of the proposed health care overhall bill being pushed by the Democrats is slightly less obnoxious than the House Bill which passed recently. So, we decided to look at this bill to determine the financial impact it will have on XXXXXXXX XXXXXXXXXX should it pass. No more mini-med plan. No lifetime maximum benefit. Pre-existing conditions must be covered for new hires. Preventative care, including dental and vision, must be covered with no co-pay. You can have a waiting period for new hires, however if the waiting period is 30-60 days, XXXXXXX XXXXX will be punished by paying $400 for each new hire. So, if your turnover is high, and you have a 30 day waiting period for example, you would be punished by paying $400 X number of new hires in a year = $ ?. If your waiting period is 60 -90 days, the punishment is increased to $600. Rates have to be actuarialy set utilizing a two tier rating system. What this means is that the cost differential between an employee age 20 and an employee age 60 cannot be more than 2 to 1. Since your group’s average age is 24, your rates would be increased approximately 70% to abide by the 2 to 1 rule. Any employee who elects not to enroll in your group plan and is eligible for a health tax credit, XXXXXXX XXXXX will be punished by having to pay $3000 for each employee eligible for a tax credit, or $750 for all +3000 employees, whichever is less. These are just some of the “surprises” you will find in this Senate Bill. What would be interesting, and I think would be necessary, is to drill down on the final House/Senate Bill (which will surely pass in some form) to determine the financial impact on your business. Then you will be in a position to determine how to pass that cost on to your customers. Example; suppose current health cost to XXXXXXX XXXXX is 6% of payroll. Assuming a +70% increase in rates, that would increase to 10.2% of payroll. The difference is +4.2% increase in cost. Lastly, should Congress pass anything close to what we see now, there will be little need for insurance agents or insurance consultants. Benefits will be mandated, you will have little or no leeway to build a plan that fits your corporate philosophy. You will be at the mercy of government bureaucrats. Several states are exploring the possiblity of opting out of the Obama plan. There may be an opt out provision, but what we see is a limited opt-out provision. The thinking here is that if states are required to participate, one of them may file a lawsuit with the Supreme Court – unconstitutional to require citizens to purchase a car, a home, a health insurance policy, etc. The fear of the Obamanites, as some think, is that such a lawsuit may prevail, and if that happens their plan to take over 1/6 of the economy may unravel. We are not too certain if this argument has legs. We are going to keep on top of this. Once the bill passes, which we feel strongly one will in some form or fashion, we will attempt to quantify the financial impact on your business. You will then be able to adjust your pricing appropriately. Could This Foreign Drug Co. Make You 50% Profits (or more) in 2010? This generic pharmaceutical drug manufacturer has been around for 25 years and not only leads this foreign nation’s domestic market – it is a major player throughout the world, including the United States. This pharmaceutical manufacturer has developed a new drug for diabetes and is awaiting FDA approval. Approval is expected. Estimated market share in the United States will be 26%, earning enormous profits for this foreign based manufacturer. HealthSmart Holdings, Inc. announced that it has successfully completed a recapitalization with Silver Point Capital, L.P. and the Company’s other lenders. Silver Point Capital, L.P. is a private investment firm based in Greenwich, Connecticut. The firm manages hedge funds for its clients. It invests in the public equity, fixed income, and hedging markets of the United States. The firm primarily invests in securities of distressed, large-cap, and Mid-cap companies; bank debts; bonds; and trade claims. It specializes in credit analysis and diversified credit-related investments. We have all been hearing about the health care debate in Congress from the media these days. But do any of us really understand the vast implications in store for us should the House and/or Senate version become reality? Health Care Service Corporation (HCSC) and its subsidiaries are committed to the highest standards of business ethics and integrity as well as compliance with all applicable laws and regulations governing its business operations. HCSC requires that all employees adhere to these standards. Doing so will enhance and reinforce the Company’s status as a responsible corporate citizen and will maintain the confidence of the Company’s employees, customers, providers and the public in its honesty and integrity. HCSC adopted a Code of Business Ethics and Conduct (the “Code”) to further its commitment to a culture that promotes legal and ethical behavior. The Code defines HCSC’s values and behavioral expectations for every employee of the Company. We place the utmost importance on the observance of these principles. Compliance with the Code is a condition of employment for every HCSC employee. HCSC’s excellent reputation depends not only on the conduct of its employees but also on the honesty, integrity and good judgement of the people and organizations with whom we do business. We value the relationships we have with our producers. We realize that these relationships are built on trust and cooperation and many have developed over years of working together. We must always maintain the highest standards of integrity and objectivity in these working relationships and we will not conduct business with anyone who does not operate with integrity or who compromises our Company’s values and ethical standards or encourages our employees to do so. HCSC’s Code of Business Ethics and Conduct is available on our web sites at www.bcbsil.com, www.bcbsnm.com, www.bcbsok.com and www.bcbstx.com. Please share this information with your employees and agents who do business with HCSC. Of particular importance are the integrity standards related to conflict of interest, fair competition, confidential information, accuracy of records and gifts and gratuities and I ask that you review these standards carefully. Your understanding and support of our Code will allow us to work effectively together and with the highest level of integrity. As a producer selling our products, you must bring forth any concerns of suspected health care fraud or other questionable practices. The toll-free Integrity Hotline number is 1-877-272-9741. Persons reporting such information need not identify themselves. The Hotline is available twenty-four (24) hours a day, seven (7) days a week. If you have any questions regarding HCSC’s Code of Business Ethics and Conduct, please call the Hotline. We appreciate your cooperation. Thank you. Editor’s Note: “We (Blue Cross) will not conduct business with anyone who does not operate with integrity” – What a novel concept! Half guilty, half pregnant Arnulfo Olivarez, self-admitted felon, has had his upcoming November 24 sentencing postponed to March 4, 2010. It seems that the Wheels of Justice turn ever so slowly. He has petitioned the court to allow him to contact school districts again as a means to continue his insurance livelyhood. Despite pleading guilty (August 2008) to bribing public school officials in return for lucrative insurance contracts, the Texas Department of Insurance continues to approve his insurance license renewals – he remains an active insurance agent. According to Texas Department of Insurance, Olivarez currently represents Aetna, American Heritage, American Zurich, Anthem, Assurance Company of America, Aviva Life Insurance, BCS Life Insurance Company, Blue Cross & Blue Shield of Texas, Conseco, Cypress Texas LLoyds, Delta Dental, Empass Indemnity, Foremost County Mutual, Hartford, HM Insurance, Golden Rule Insurance, Humana, John Alden Life Insurance Company, Kanawha, Lincoln Benefit Life Insurance Company, Maryland Casualty Company, National Union Fire, New Era Life Insurance Company, New York Life Insurance Company, Northern Insurance Company of New York, Pacificare, Pan American, Principle, Prudential, Southern County Mutual, Standard Insurance, Sun Life, Transamerica Occidental, Unicare, United Healthcare, and Unum Life Insurance Company of America. As a friend wrote this morning, the Federal Government can not run a health care system much less manage a two car funeral procession. The Left’s health care “reform” plan will dramatically expand eligibility for Medicaid, a poorly-functioning program created in the 1960s to help low-income families. The Health care “reform” bills advancing in the House and Senate would expand Medicaid by making this government-run health plan available to all adults with incomes at or below 150% of the poverty line. The change would dramatically multiply eligible recipients, with 46 states seeing increases of at least 20%, including 16 posting jumps of 50% or more. 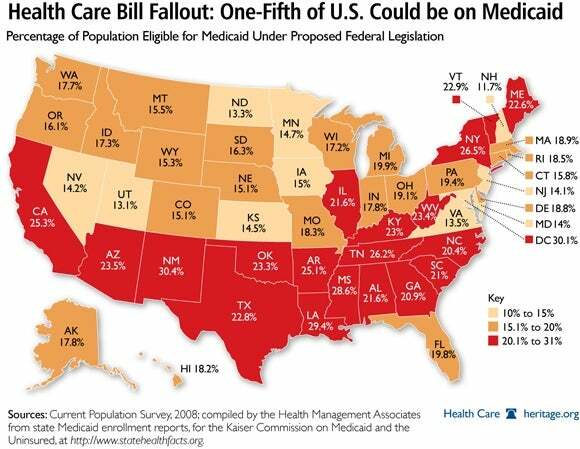 Almost 21% of the entire U.S. population would be eligible for Medicaid and seven states and the District of Columbia would have eligibility rates of at least 25%. Meanwhile, Heritage Vice President Stuart Butler debunks liberal myths about the proposed “trigger,” which would create a government-run health care “public option” if other reforms fail to work. This mechanism, he explains, provides few incentives to experiment with new approaches and its criteria would be hard to measure. The Senate version of the health care bill, which has been written in secret, will probably be revealed this week, Heritage’s Brian Darling explains. The House narrowly passed its bloated big-government bill earlier this month. AP poll released today says 57% of Americans favor taxing the rich to pay for proposed health care bill. Since almost 50% of all working Americans pay no federal income taxes, this will be welcomed news for the entitlement crowd. Thousands of “rich” Americans are voting with their feet these days. According to Sovereign Natiion, hundreds of thousands are leaving – finding financial refuge offshore. Panama is attracting many, with favorable tax treatment for Americans tired of pulling the train. For an appoximate 2% load in their LTD program, employees can be insured up to $300 per month to subsidze COBRA premiums. Editor’s Note: Why would an employer want to encourage COBRA participation? http://www.healthplanlaw.com/ – Good website for ERISA groups. Also, www.stoplosslaw.com is another good resource for insurance consultants. Editor’s Note: Readers of the Art of War know that one of the most important tenents of Tzu is one’s knowledge of the “lay of the land”. Many employers are beginning to realize the benefits of hiring a fee based insurance consultant in lieu of a commission based insurance broker. There are many advantages to hiring a fee-based insurance consultant that we won’t go into here. The most interesting phenomenon regarding fees to be paid to insurance consultants versus commissions to be paid to an insurance broker/agent is the employer’s perception of costs. There seems to be a difference in writing a check to the insurance company who in turn pays the agent a portion, than in writing a check to the insurance consultant every month. Imagine having to pay your withholding taxes every month by sitting down at the kitchen table and actually writing out a check to Uncle Sam instead of having Uncle Sam’s “fee” automatically taken out of your paycheck! Chances are you would think unkind things about Uncle Sam making you do this. You would probably want an explanation of how and where your money is going to be spent. That would be a logical thought process. Consultant: Sir, based on what you expect from us in the form of scope and services, and the time involved, our fee will be $25,000 per year, payable 1/12 per month for 12 months. If at any time you are unhappy with our services and see no further use of our experience and expertise, you can fire us without notice. Employer: You have to be kidding me! That is a lot of money! I cannot afford that expense. Thank you for your time! Consultant: But sir, you are paying your insurance agent $150,000! So why is $25,000 too much? Employer: I pay my agent nothing, the insurance company pays him! Such is the life of a fee-paid insurance consultant. Most do five times the work of an agent, at 1/6th of the cost. We do business all over the state of Texas. Each area of Texas has it’s own unique flavor of politics which drives and impacts business decisions, especially at the political subdivision level. Longview has two hospitals that compete for business. Most physicians in town have admitting privilages at both facilities. As is the case in most situations, patients many times don’t select the hospital in which to seek surgical or medical treatment, their attending physician usually makes that decision. Hospitals have a vested financial interest with local physicians and to curry favor requires an on-going battle between competing hospitals. There is competition among medical care providers. So how does a self-funded employer group tap into the economic opportunities available to them in situations like this? The answer is simple. Reports from Edinburg, Texas received by our own and famous Molly Mulebrier (pictured above), tells of a Battle Royale yesterday at the Edinburg Independent School District. Seems a lively debate of a 5 hour duration sparked strong interest among the attendees of the meeting. End result? The ECISD voted to award the multi-million dollar contract to Blue Cross. Did a smoke and mirror debate regarding PPO discounts carry the day? Will the ECISD save money with this change in claim administrators? Will fixed costs go down? Will claims go down? Molly Mulebrier is adamant; she predicts costs will go up for the next Plan Year. And finally, who is going to pay the +$2 million cost of leaving? A new association sponsored employee benefits program designed for Texas political subdivisions has announced that effective January 2010 members may access an array of employee benefits. Each participating political subdivision would access the program through an Interlocal Agreement. The association will provide professional risk management services on behalf of member groups. Benefits include health, dental, vision, life and disabilty insurance, as well as auto and homeowners insurance program. Additional benefits include a stand-alone prescription drug plan, pre-paid legal insurance and dog & cat insurance. A recent poll shows that 86% of Canadians like their government health plan. Canadian doctors average income is over $200,000, and they dont have to mess with insurance companies. Nor do they have to chase dollars from their patients. And, the Canadian health care system takes up about 10% of Canada’s GDP, as opposed to 16% in the United States. Citizens pay little for their health care – no deductibles, small or no co-pays. Sounds like a good plan. But, what they pay in taxes is another matter it seems. Custodian of public information: Where did you get that…………..I just don’t see it! 2 + 2 = 5 for sure! Seems that three high school principles were out of town on school business, and late that night, in search of a hotel room, found the Sweet Dream Hotel on Wurzbach. The approached the hotel clerk, inquiring about available rooms and were told that there was only one left, and that the nightly rate was $30. Since it was late at night, and the three were tired after a long day representing their school district at a grueling seminar, they agreed to rent the room for the night. Each paid the clerk $10 for a total of $30, which was the nightly rate. So, if each man paid $10, but got $1 back, each paid a total of $9. That means that 3 men paid $9 for a total of $27. The Bell Hop stole $2, which brings the total to $29. Right? So where is the missing $1? – Government prescribed benefit plans are too rich. “Legislators want our insureds to pay no more than 35 % of their total health care costs. Eighty percent of our customers currently pay more than 35% of those costs. They do this to try to keep their premiums down. We believe it is bad public policy to force people to buy benefits they don’t need or want. What does all this mean to you? Get ready for your costs to go up 70-100% the minute the Bill passes and goes into effect. For the past two years, BCBS has been extremely aggressive in writing and maintaing new business, with rates well below the market. Bloated BCBS sales reps have reaped the benefits of well paid order takers, to the envy of their competitors. That cycle appears to be over, as BCBS has come in with some renewals lately in excess of +100%. This is not uncommon in the group health insurance business. One year ABC Insurance Company may have the best and lowest overall rates, and write a lot of business, while the next year XYZ Insurance Company will do so. Seems this phenonomen runs in 2-3 year cycles. Who is the new and agressive carrier these days? Try Cigna on your next renewal, you may be pleased. THIS ARTICLE WAS POSTED EARLIER THIS YEAR. WE ARE RE-POSTING IT BECAUSE WE HAVE LEARNED OF A BUCA WHO WROTE AN EMAIL TO A BROKER THREATENING TO CANCEL HIS CONTRACT IF HE CONTINUED TO PLACE BUSINESS WITH A CERTAIN TEXAS BASED TPA. THESE KINDS OF MAFIA TACTICS HAVE NO PLACE IN THE INSURANCE INDUSTRY. EMPLOYERS ULTIMATELY PAY THE PRICE – A “SHAKE DOWN” ON A CORPORATE LEVEL SHOULD BE CONDEMNED. YET, BROKERS WHOSE SOLE SOURCE OF INCOME IS CONTROLLED BY A FEW INSURANCE COMPANIES, REACT IN FEAR. THEY FALL INTO LOCK-STEP WITH THOSE THAT CONTROL THEM. Insurance brokers fear insurance companies because they know the carriers can, and have, terminated agent contracts at will. Cost Plus Hospital Reimbursement – Will Hospitals Refuse to Treat You? Cost-plus hospital reimbursement is nothing new. Years ago Blue Cross paid member hospitals their cost plus 7%. An annuity feature in their hospital contract assured participating hospitals of a steady cash flow, which is still a feature found today in a standard BCBS hospital contract (we have a complete copy of the BCBS hospital contract). Cost plus has saved our clients on average +40% in hard dollar claims. We have not had any hospital refuse to see our members – we guarantee each hospital a fair profit; we do not promise them an open checkbook. If the cost-plus approach saves their clients 40% or more in claims, and is something that BCBS pioneered many years ago, why would a broker be against the concept? After all, isnt the broker acting as an agent of the employer who pays him? You: Man, I really screwed Chevrolet this afternoon. They wanted $48,000. They dropped the price down to $45,000 but I held out, showing them their costs which I found on a website. The sales manager told me the information I got off the internet was wrong, but that he could give me the truck for $43,000, as long as I didnt report him to the Dealership Sales Manager. After two hours of intense haggling, I got the price down to $23,000. The salesman was smiling, but his manager said that they were losing money on this sale but that they would make it up on the next pigeon. Your Spouse: Oh Nooooooooooooo…………………………you should never have done that! Our whole family is going to be Black Listed now! The dealership will probably tell all our friends how bad we are. THEY WILL NEVER AGAIN LET US BUY A CAR OR TRUCK FROM THEM!!!!!!! You: Damn, I never thought of that! I feel really bad now. What should I do? Your Significant Other: Go back immediately and tell them you are sorry. Give them a blank check and tell them to fill it out for you, for any amount they normally charge pigeons. We are seeing group health renewals that make no actuarial sense these days. Renewals are all across the board. We are seeing renewals as high as +120%, with significant spread differences between carriers bidding on business. One of the BUCA’s told us last week, on a renewal we were working on with them, that they were not going to give any credit on claims exceeding the pooling point. And, there appears to be little interest amongst the carriers to negotiate renewals. We are seeing carriers, bidding on the same group, using the same claim experience, duplicating benefits, with cost basis differencials of as high as 38%. Two underwriters, looking at the same data, are coming up with rates that statistically have no correlation. Welcome to healthcare reform! A lot of insurance companies are taking a playbook from the drug companies. Over the last 3 years the drug companies have systematically and substantially raised their prices. They did so because they knew the government was going to beat them up for discounts. The insurance companies are doing the same thing. They know the government is going to beat them up so they increased their rates even when the MLR seems in line. Most insurance companies don’t experience rate at 100%, they have a modified experienced /community rating system. It allows them to “hedge” their bets during uncertain times. Guess what….We are in very uncertain times particularly if you are an insurance company. Premiums always represents risk. Some of the risk inherently rests with the client, evidenced by the MLR; however, some of the risk is outside the client, which includes among other elements, regulatory hostility, provider contract renewals, increases in Rx prices and the like. Though I understand Bill’s assertion, about what XXXXXXXXXXXXXXX should have done, the extra charges reflect their nervousness to the items mentioned supra and the government is making a lot of people nervous. As I said, welcome to healthcare reform! Arnulfo “Half Guilty, Half Pregnant” Olivarez is scheduled to be sentenced for his crimes at 9:00 am on 24 November, 2009 in Federal Court, McAllen, Texas. Mr. Olivarez plead guilty to bribery of public officials in order to gain lucrative insurance contracts in South Texas. Last August 2008 Mr. Olivarez told Federal Judge Hinojosa that he was only half guilty of the crimes he was charged with, but guilty on the other half of the charges. If that is so, then Judge Hinojosa should consider reducing a possible 20 year sentence down to 10 years. Is Brownsville Independent School District Practicing Obscurantism ? Is the BISD paying more than they should for admnistration of their self-funded health insurance program? Did the Board of Trustees award the contract upon the advice of their insurance consultant, and if so, did the consultant’s representation of costs mirror the Administration Contract presented and approved by the BISD after the award of the contract? Did anyone check to compare the contract to be approved against the contract that was awarded? Information we obtained under the Open Records Act suggests otherwise. Information at hand shows that the BISD may be paying +$370,000 more than they bargained for. We asked the BISD to investigate, to determine if indeed our findings are accurate. Their response was abstruse and at odds with our inquiry. The BISD response, in our opinion, offers the general public both the frisson of uncertainty and the challenge of speculating. However well intended, speculating in an informed manner, as to the truth surrounding the recent Request for Proposal process of the BISD $38 million group health insurance plan, can be illusory and dangerous. Preference should be given to exploring the facts. We hope that the BISD will stop stonewalling the public and comply with public record requests honestly and expeditiously. We have sent a second request to the BISD asking for clarification of the mysterious $370,000.